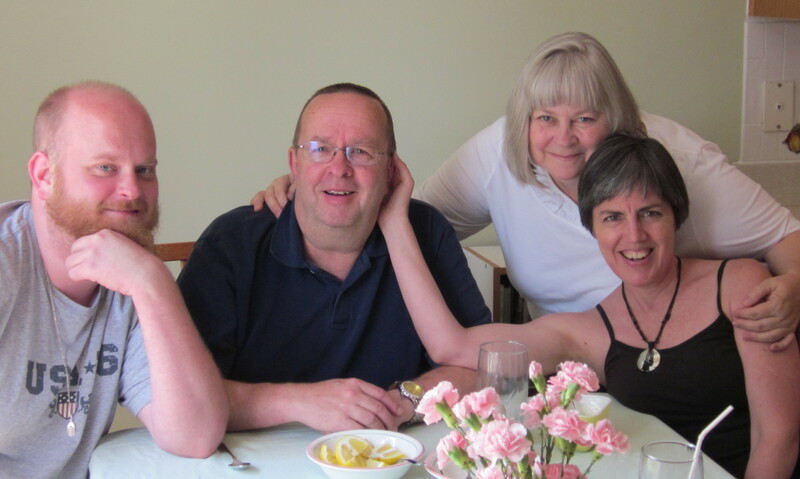 Kim has joined, and of course helped to transform a little meet-up group in Durham. They call themselves the Gals with Gumption. Her friend Daphne calls it her F__k You I’m Over Fifty group, which she likes better. Am I going to get like that when I’m over fifty? Ask me in three weeks. Anyway, she took me out with her new friends yesterday morning at 8:30 (5:30 California time) for a three mile walk in the shade. “In the shade” is a relative term, since the heat and humidity here doesn’t seem to care if you’re in the shade or not. Especially when you’re walking three miles. Iced coffee afterward was a nice treat. 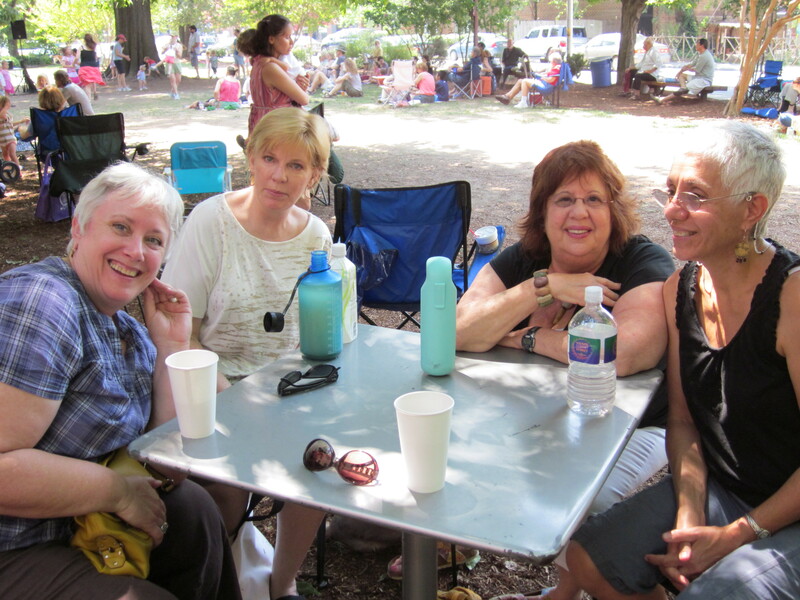 Then we met more of the group at Weaver Street Market in Carrboro. It was a lovely outdoor setting at a very upscale market with live music. One of her new friends was teaching the group how to play Mah Jong. As we walked in to the area, I told Kim she had been lying to me all this time. She does NOT live in the South! This was a little slice of Berkeley, complete with Birkenstocks, beads, braids, organic chai, multi-ethnic dancing, and bumper stickers for peace. I ended up talking to one of the new members of the group about world travel. She’s my kind of traveler. She recently spent a month in Ethiopia because it’s the only African country that was never colonized by the Europeans. I did not know this. It’s also the second oldest Christian culture. The Armenians apparently are the oldest. Oh, I have so much to learn. She went there because she wanted to understand who these people are, and how they managed to stave off colonization. Now that’s travel. Ooo laaa laaa. We’ve both been to India, and shared about our impressions and experiences with the culture and the people. The Hindu mindset, the Sanskrit, the unbearable poverty, the beauty, the paradoxes. I was definitely not in what I thought was the South! Jonathan was one of three of my Destiny students who traveled with us to Northern Ireland in 1995. He’s now 32. Back then, he was a High School Junior. I don’t want to bore you with all the details. This blog is ultimately about relationships. I can say one thing. If you struggle finding true, deep, life-long friends, might I suggest stepping into the trenches with someone? Sign up for an adventure. Do something really scary, courageous, crazy, dangerous, controversial, or otherwise OUT of your COMFORT ZONE with people you don’t know, or hardly know. There, with all the dross of pretense and politeness burned away, you will find souls to cling to like life preservers in the stormy sea. Some of these you will find yourself still clinging to long after the storm has passed. So glad you are having a “turning 50” adventure! How awesome!! I celebrated that event a few years back, and my life seems to have been on the “adventurish” side ever since! Please give hugs to Pam, Kim , and Harrah for me. Have a great trip. Thanks for commenting, Paula. Will pass around your hugs as I go. Turning 50 is such an amazing time for me because my father died at the age of 49. Every year now is a gift to me and I remember to tell those I love everyday that they matter and I love them. Have a wonderful trip! Thanks Catherine. Great advice. I’m sorry you lost your father so young. I still have both my parents, and I’m grateful for every day we have together.